Update: Seemingly lending credence to the rumour that the next Hearthstone expansion will be called Whispers of the Old Gods, an eagle-eyed Redditor has found this logo lurking on a wall in Brooklyn. Blizzard previously announced that it will make an announcement as part of the Americas Championship which begins on Friday, at which point we should find out whether that really is the name of the new card set, or just some spectacularly elaborate trolling. Original: Last week, Blizzard teased big Hearthstone news that would be announced this weekend at the Americas Winter Championship. We speculated—because that's what you do when you're dealing with an announcement of an announcement—that it would include details of the next card set, which will go live alongside the new Standard format this spring. But we may have a head-start on what's coming, thanks to some sleuthing by Youtuber Disguised Toast (love that name) and the denizens of the Hearthstone subreddit. According to their collective deduction, it looks very likely that the expansion is going to be called Whispers of the Old Gods. 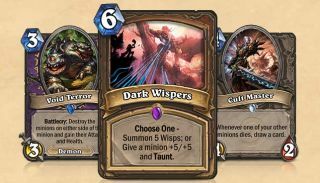 First up, Mr. Toast, who notes in his video that, just as it did with the Blackrock Mountain expansion, Blizzard has changed the five cards on the front of the Hearthstone website, making them now Mind Blast, Void Terror, Dark Wispers, Cult Master, and Faceless Manipulator. Each of them, he explains, has a connection to the “super, super, super evil, powerful Eldritch horrors” who live, trapped, deep beneath the surface of the world. He also points out a rumor posted by the Italian site powned.it in February, which claimed that the next Hearthstone expansion will be about the old gods, and that a “possible name” could be Whispers of the Old Gods. The Hearthstone subreddit, meanwhile, is theorizing that Tyrande Whisperwind, Lady Liadrin, and Maiev Shadowsong will be the new Priest, Paladin, and Rogue skins, and (more relevant to our immediate interests) that the Dark Summoner, Sinister Cultist, and Bloodaxe Ritualist cards could appear in the next expansion. That information comes out of a leak that actually occurred in late 2015, which as BlizzPro says correctly predicted some of the cards that appeared in the League of Explorers expansion. And again, all three of those cards are natural fits for Old Gods shenanigans. It's all very vague and oblique, and obviously far from official. But it sure comes together nicely, too, and it's not as though dropping hints in advance of a big announcement is uncharted territory for Blizzard. So even though I can't say for certain that this is what's happening, it sure looks legit to me. Our man will be visiting Blizzard HQ later this week to find out what's what. Let's hope he doesn't lose his mind to eldritch horrors. Although playing against Secret Paladin for much longer will probably have the same effect.